Another year come and gone! This year has been nothing short of life-changing. I graduated with my masters in Wildlife from the University of Alaska Fairbanks, moved from the Interior to the incredible Southeast Alaska, married the love of my life, and have a job I love! Life is great, and life has left me less time to blog recently (lack of time compounded by no internet at my house). However, that doesn’t mean that my camera has been sitting picking up dust in the corner. On the contrary I’ve been out photographing the wild beauty of Hoonah and Alaska all year. Some of these images from 2016 have made their way onto Facebook. You can “like ” my page for daily photo updates at www.facebook.com/ianlww. For other images this is the first time they’ve been shown off! Previous year-end recaps have been in different formats such as dividing by month in 2014 and dividing by topic in 2015. This year I’m just going to scrap the text and the give you the top shots 2016 from around Alaska. I hope you enjoy! An American Dipper perches with a mouthfull of food that it just scavenged from the river’s bottom. A mature humpback whale breaches in Hoonah, Alaska. The city of Haines sits below jutting mountains. On the evening of December 8th this year, a wonderful series of phenomenon occurred. The sun went down, the aurora remained muted, brilliant stars of the Milky Way dappled the darkness, and a new moon sealed the deal for a night of very dark-skies. I left the orange glow of Fairbanks behind and set off on a quest into the inky darkness of interior Alaska to photograph the Milky Way Galaxy. When photographing the galaxy you are capturing the “galactic plane” which is the stars which spin out from the “galactic center“. Our sun and solar system reside on the edge of the galaxy, and give us the opportunity to look into it. However, depending on the season and the photographer’s location on the planet, the true center of the galaxy may not be available. In Fairbanks the galactic center would be visible in the summer when it is always light. During the winter the galactic plane of the Milky Way is visible, but we do not get an opportunity to see the center because we are blocked from it by the planet. Fairbanks has not felt wind for over two months and snow which would ordinary not persist with wind clung to the spruces encasing them . I angled my camera at the bases of those trees and slowly moved at up into the sky after each exposure with the goal of creating panoramic ‘stitches’ of the Milky Way. The method compounds the star density of the galaxy, and brings out distant features like a nebula seen in the upper left of several of the images. I hope you take to opportunity to view dark skies when you can! A panoramic stitch of the Milky Way and a nebula cluster in the upper left. I was able to achieve the most definition of the Milky Way in this particular shot and misty veils of aurora float through for effect. A tall vertical stitch of the Milky Way over a winter paradise. The nebula cluster in this shot is pointed out by a snow covered spruce that arches into the picture from the left. The Milky Way springs out of this crotch formed by these snow-covered spruces. A distant planet, perhaps Venus, is particularly bright in this image. The hoar-frost covered trees are a testament to the lack of wind in the region. During my trip home to Minnesota I have taken what I have learned about aurora watching in Alaska, and transferred it to conditions in the midwest. In doing so, I traded watching the aurora over snow drifts to squinting my eyes over bean fields with moderate success! A big push of energy from the sun has elevated geomagnetic energy to KP 6 or a G2-“Geomagnetic storm level 2”, which boosts the aurora to Minnesota, and even beyond. The two nights I chased the aurora brought success in both capturing the aurora in central Minnesota, and for playing with some new techniques which I will be honing in the upcoming year and are featured below. I would love to hear your feedback! This timelapse below is fairly short and does not have a brilliant aurora, but does give a great idea of where to look for the aurora in Central Minnesota. During this G2 storm. In Alaska the aurora during a G2 storm would be far overhead and taking up the whole sky. In Minnesota it rose slightly above the horizon. Viewing would have been better if the smoke haze and moonlight could have been removed. The first night that I chased the aurora, a strong wing was rapidly pushing the clouds past this moon, which was fortunately setting. I really like the wind in the trees of this particular shot, as well as the long shadow cast by the moon. 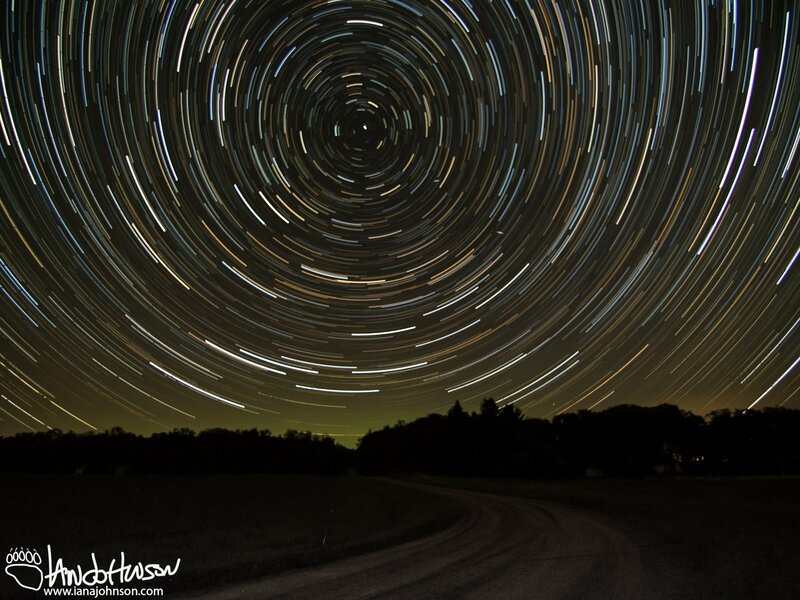 This star spin shot captures a 1.5 hours timelapse of star movement in the sky. Fortunately I captured the faint glow of aurora on low on the horizon, and directly below the pivotal star – the North Star. One of the techniques I am very interested in growing is the ability to capture full panoramas of the milky way. The progression of images below shows a little bit on how that works. I learned a lot in this first attempt. A few key findings : 1) find the darkest skies possible! The light pollution shows here. 2) need to have more overlap in the shots 3 ) I tried to capture the whole galaxy in one sweep of the camera. I now know I can stitch multiple rows of shots to capture a larger area 4) keep the ISO of the camera low-ish to reduce noise. For those reading this with experience in capturing the Milky Way, please contact me, it would be great to pick your brain! This image does a nice job of capturing a single image of the Milky Way. However, I would like to find darker skies. By taking multiple shots with the camera on the same plane, I can stick them together into the results below. Here is one of the things I am struggling with in capturing a full panorama of the Milky Way. This image has a gorgeous amount of contrast, however, after stitching, I did not have enough horizon to create an image that can be cropped well. I would love to get feedback on the best way to straighten and correct these images. This image is the best example I have of stitching the Milky Way, but is far from the entire arch. I do really like the bit of aurora that shows up here. Hopefully I can apply what I learned in my next attempt! 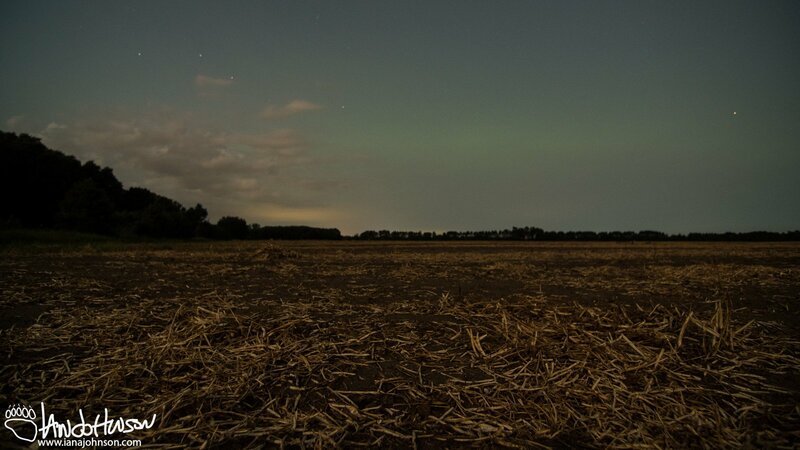 This image of the aurora was taken in Rice, Minnesota during a G2 auroral storm. If it weren’t for the moon and the haze it would have been a much nicer show! I have done a lot to curate my aurora gallery on Fine Art America. I would love if you checked it out! Leonid Meteors, Aurora Borealis, Angel Rocks, Alaska! We shut the truck off and stepped out into a cool night and a light breeze which shocked the face. My friend Ross and I were after auroras, and we planned to summit Angel Rocks in the Chena Recreation Area to spend the night and watch it. The sun was low in the sky as we started up the 1.6 miles to the summit of Angel Rocks. By the time we had reached the top of the ~1000 foot climb, the breeze funneling up the canyon below had stopped, and the sun melted into the horizon leaving a blue and gold light which lingered for hours. With short days in Fairbanks, it was hard to forget it was only about 5:30! There was a lot of night to go. I was delighted to find a cave at the top of Angel Rocks. It was two ended and had large crevasses in the ceiling to view the stars. In the middle I could stand all the way up, and the larger south facing entrance was almost 8 feet tall. I’m just speculating, but I think this cave was formed as a magma bubble. The geology of the summit was far different than any geology I had seen in the Fairbanks region. In contrast to the normal scree slopes and shale of the region, the exposed rocks were granite and had forms which suggested bubbling magma. The rock outcrop where we stood was very unique! The cave at the top of angel rocks was amazing! The double entrance was passable and you could easily stand up inside. Here is a picture from out of the cave looking south. You can just see the tail of the milky way. In a collision of natural phenomenons, the Leonid meteor shower lined up with an incredible aurora display. Each year the Leonid meteor shower peaks around the 17th or 18th of November. Named after Leo, the constellation that they seem to radiate from. The Leonids Meteor Shower is actually small pieces of the comet Tempel-Tuttle which burn up as they enter our atmosphere. Incredibly, the size of the majority of particles range from grains of sand to pea-size.The largest meteors are often only marble sized pieces of comet. That’s a lot of light from a particle the size of your favorite shooter!! These particles burn up because the air in front of them is compressed and heated which scorches the meteor. That’s way different than I was ever taught (i.e. they burn up because of friction with the air). How fast do they have to be moving to build up that air pressure? The particles can enter the upper atmosphere at 160,000 mph! The Leonids were 24 hours from peak activity, and throughout the night they dazzled us with frequent and long tails. A Leonid meteor streaks through the Milky Way – how cool is that?! As the sun set the aurora immediately started up. In fact, with an ‘official’ start time of 5:30 PM it was the earliest I have ever seen the aurora appear! It certainly seemed to be a good omen for the night to come. The aurora had already ‘booted up’ as the sun set. That’s an incredible show of energy!! Over the course of the night we enjoyed three bursts of incredible aurora. From 5:30 – 7:00 PM, 9:30 – 11:30 PM and from 5:30 – 6:30 AM. Although sleeping in the cave would have been VERY awesome, the night was so warm that I was content to roll out my sleeping bag under the stars and slumber around midnight. I awoke at 5:30 AM not minutes before an incredible corona dominated the overhead skies (captured in timelapse!). I think my aurora sense was tingling and telling me to wake up! This capture of the aurora over Angel Rocks, Alaska pretty much says it all. The lone spruce, rock outcrop and rich aurora all make for an amazing shot! An Aurora selfie. Silhouettes are great! The Aurora and Milky way melt together over angel rocks. An amazing corona formed over Angel Rocks. This was at 5 AM! The scale of the aurora on 11/16/2014 was like nothing I had ever seen! A remarkable corona overhead at Angel Rocks! For the second night in a row the aurora put on an unforgettable show. I think the aurora are like fingerprints. They may look alike, but none are ever the same! For its immense status in the sky, I had never seen aurora that stayed as intense as this one. At times you could have read a book by it, and all through the night the sky was filled with incredible beauty and auroral ballerinas. In Minnesotan, it was “oofda good!”. Two nights ago I watched the Aurora with someone for whom it would be their last (for awhile), and last night I brought someone out for their first experience of it ever! Both moments are joyous, I believe and this is the tale of two auroras. Both of the nights have been put together into this timelapse which is undoubtedly one of my best to date. I grin at how well the music matches the event and the footage here gives a certain feeling to the urgency of the Aurora. The new moon on the 25th provided inky darkness for a backdrop and the aurora used green and pink ink to sign its signature in the heavens. We were able to enjoy the brilliance of the Milky Way just as much as the Aurora which presented us an excellent show! Two lone spruce trees stand watch of the Milky Way which spanned across the sky. Dark skies are one of the hardest things to comprehend, but they are BEAUTIFUL! The explosion of activity over Eagle Summit – whoa! On September 26th the hype was high that the Aurora would be booming. In fact, I believe there were shows in Minnesota last night, and may be tonight too. Keep your eyes up! One of the shots I wanted to highlight was this 30 minute exposure of the aurora. I have been trying to pull of this shot for a very long time, and the moonless night provided just the backdrop! The north star is the non-moving point of this shot. I couldn’t be more happy with it! I must admit this is a shot I have been trying to pull of for quite awhile, and finally think I nailed it! 😀 This a 30 minute exposure of a low-grade aurora and the north star. The moonless night kept the exposure from blowing out. This is basically how it came out of the camera. Very cool to see the north star stay still and the rest of them move!! I wrangled my housemate Roman to go out for the Aurora with me. He is an international student who had not had the opportunity to see the the Lights before. The show actually burst at 9:30 and presented some great colors including the “watermelon aurora”. To top it off Roman was creative enough to build us a small fire – it was a great night! A small fire and the Aurora to keep this group warm. It was Roman’s first aurora! It’s been a busy couple of weeks, as I’ve been spending my last couple of weekends in Chena Hot Springs in pursuit of small mammals; specifically the water shrew. My work out there has been with Jonathan Fiely, who describes these small mammals as “the river otters” of the small mammal world. They are active hunters which snack on small minnows and invertebrates that they catch. Unfortunately, our success in nabbing one of these tiny, elusive creatures was zero; however, the nights we spent out doing it were well worth it. Last weekend was that big Full Moon. If you didn’t catch it that’s too bad! Although, there will be others ;). One of the fascinating facts about the moon is that it’s the same phase for everyone in the world. It connects us all. Although that may seem like common sense, with the quickly dying daylight hours here in Alaska, I’m happy to know that some of the celestial events are shared with my hometown Minnesotans and adopted Mainers. The moonlight off the tributary to the Chena River was a bright, ivory road. It was impossible not to stand there and just look at it – although I may have benefited from sunglasses it was so bright! 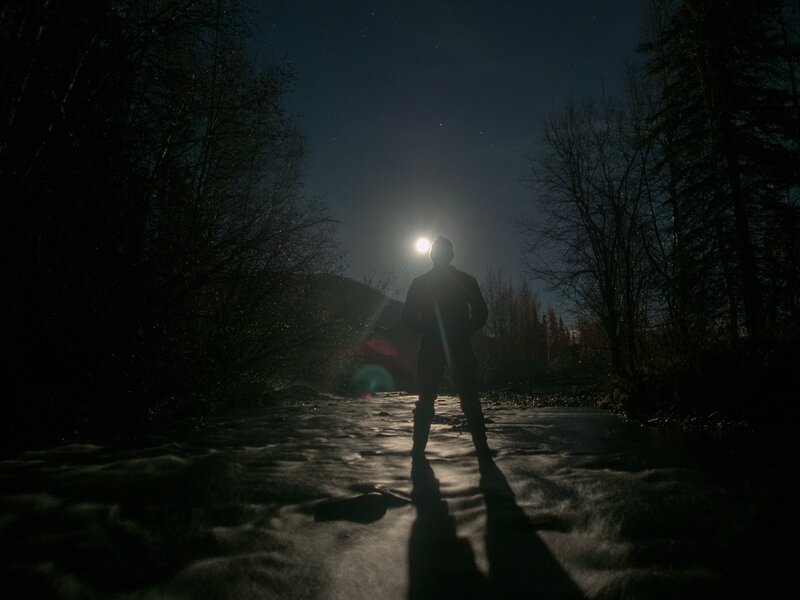 Here you can see me standing in the river (not on the ice) looking at that big moon. Full Moon at the Chena Hot Springs.The moonlight off the tributary to the Chena River was a bright, ivory road. It was impossible not to stand there and just look at it – although I may have benefited from sunglasses it was so bright! Here you can see me standing in the river (not on the ice) looking at that big moon. One of the big news events of the week for me was a large X1.7 and X2.0 Solar flare from the sun. These events are the triggers of the Aurora, and this was one was described by NASA as “A canyon of fire over 200,000 miles long”. Based on this information I was VERY excited to head up north for the weekend and get away from the light pollution of Fairbanks in hopes of getting some really good looks at the Aurora. After reviewing the Aurora forecast (http://www.gi.alaska.edu/AuroraForecast) it looked like there was going to be a decent chance of getting at least a ‘moderate’ display up north. So, I packed up my photography gear, gun, and camping stuff and headed up 85 miles north with Ross Dorendorf to the Twelvemile Summit on the Steese Highway. We could not have picked a better day to be up in interior Alaska. The day was actually very, very warm for the end of October, I think the high was probably near 35 degrees. We were in pursuit of Ptarmigan so we headed up the ridge tops, hiking for a few miles. Although the ptarmigan tracks printed in the snow were abundant is certain areas we never saw a single ptarmigan. We were lucky enough to see a large snowy owl on the slope below us. As soon as he realized he was spotted the owl took off from the ground and flew along the ridge top in front of us, about 300 yards away. He was very large! I would say the size of a large gull and flapped gracefully. Here are a series of pictures and a 360 degree video from the summit of the mountain. As you can see, it wasn’t a bad day out there! 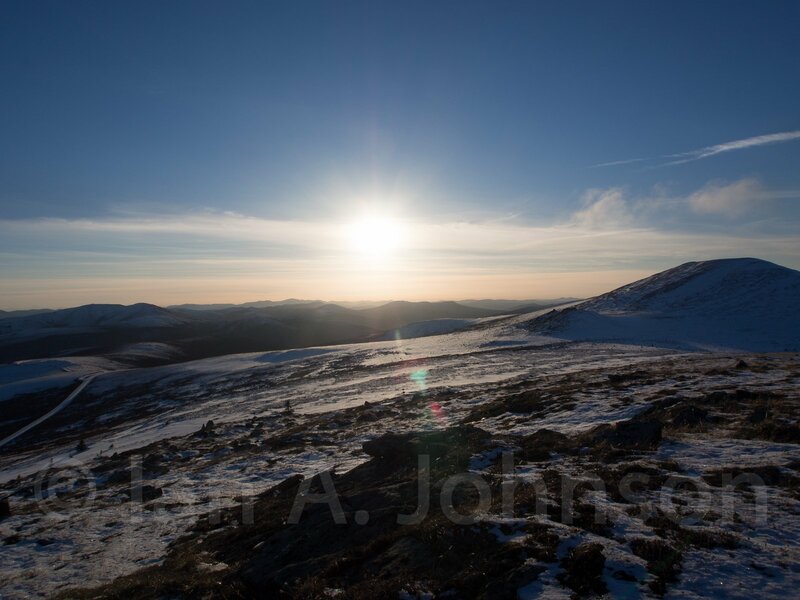 Once we reached the top of the ridge the mountains stretched all around us and the sun shown off them brightly. 12 Mile Summit on the Steese Highway. We hiked down from the ridgetop and got back to the truck right as the sun was disappearing. The warm temperatures were also disappearing. What a sun driven system we have here! 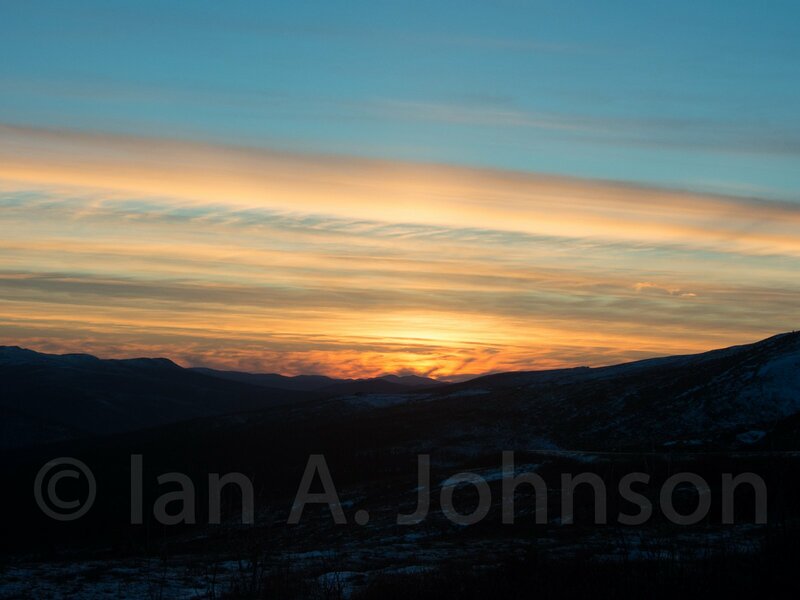 The sunset was indeed a beauty and the clouds to the south, which were likely covering Fairbanks, lent themselves perfectly to the orange and yellow bands in the sky. Sunsets are one of my favorite parts of any day, especially days spent outside. What a glorious way to end our hike in the mountains! Once we were done with the sunset it was time to get down to making camp. Now don’t get me wrong, camp on this trip was pretty straight forward. I was to sleep in the back of my truck and Ross was to sleep in his tent. We weren’t too interested in leaving some of the conveniences of car camping behind. So, Ross fired up his stove and soon had a warm, salty, cheesy and DELICIOUS batch of macaroni and cheese going. I had tasked myself with making a batch of monkey bread in the dutch oven. Monkey bread is also called pull bread and is a doughy, cinnamon sugar filled wonder. Its hot, sweetness is the perfect end to any day. Dutch oven cooking is a small camping hobby of mine. It involves a cast iron pot which is heated from the top and bottom with coals. You can bake an assortment of meals and desserts within it; if you can make it in a traditional oven at home, you can cook it within the dutch oven. The picture below illustrated the heat on top and bottom of the oven. 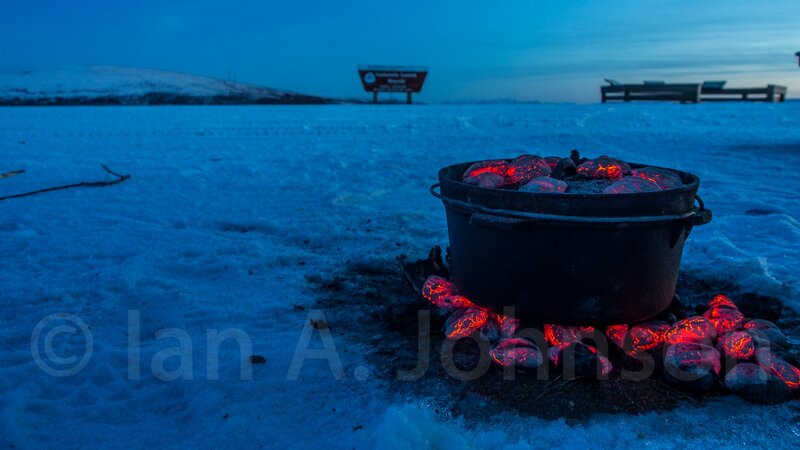 Here you can see dutch oven cooking. The heat is placed above and below the pot which heats it evenly on all sides. You rotate both the oven bottom and lid to ensure the contents are baked as evenly as possible. In here I’m making Monkey Bread, but you can make an assortment of cobblers, root veggies, pot roasts or many other items! In the background you can see the 12-mile summit trail sign. As we sat and digested the food we had eaten the night got darker and darker. The twilight finally gave way into complete darkness and we were humbled and awe-struck by the stars above us and around us. 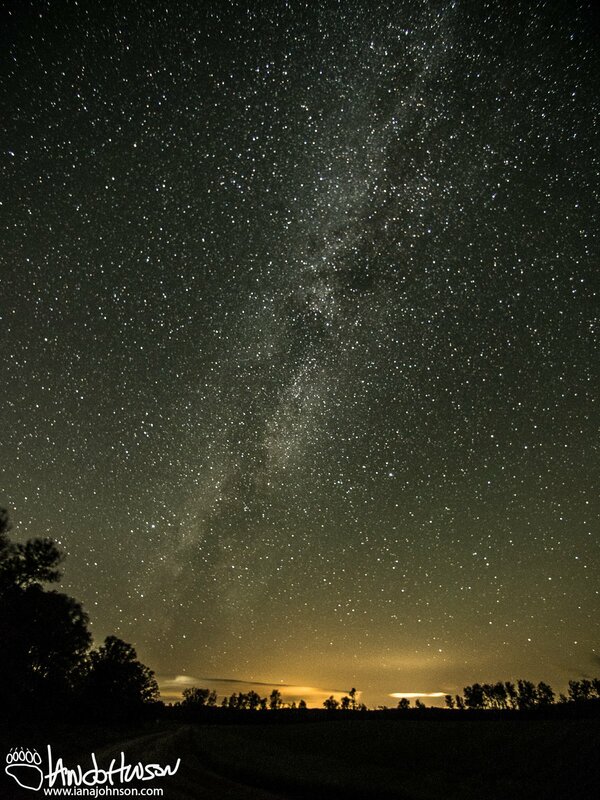 The milky-way cut through the sky in a large creamy swath. I did my best to capture the milky way. The images you’ll see below have been enhanced in contrast to help bring out the color and feel of the multitude of stars and the grandeur of the milky-way. However, you’ll see in the first image an orange tint at the bottom of the image. 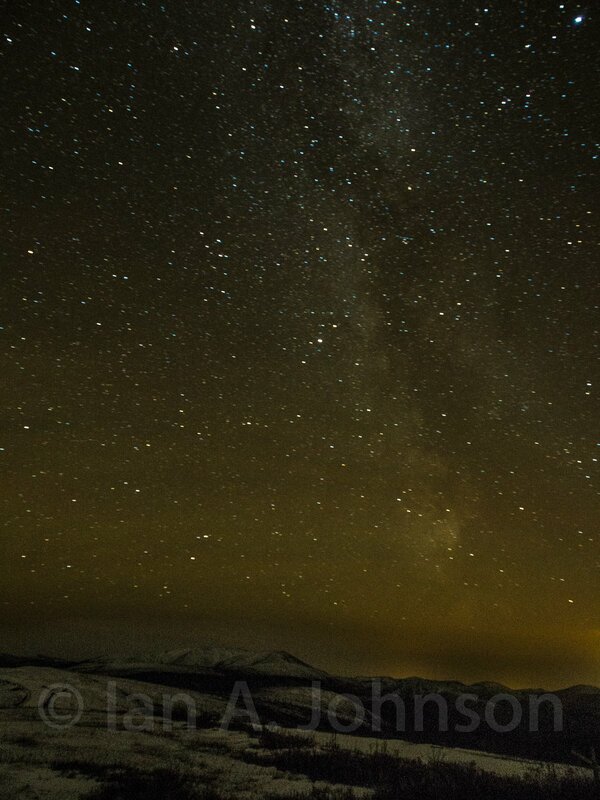 What you are looking at is actually the light pollution from Fairbanks. Even 80 miles away, in the state of Alaska, light pollution is filling our skies. In some point in our history, there will never be a black sky ever again. This presents more than aesthetic, human problem; birds are known to navigate by light and become disorientated by the lights of cities and within the ocean. If you don’t think it’s a big deal, think about being a bird as you fly into your next airport at night. The second image you see below has been modified to remove the light pollution. 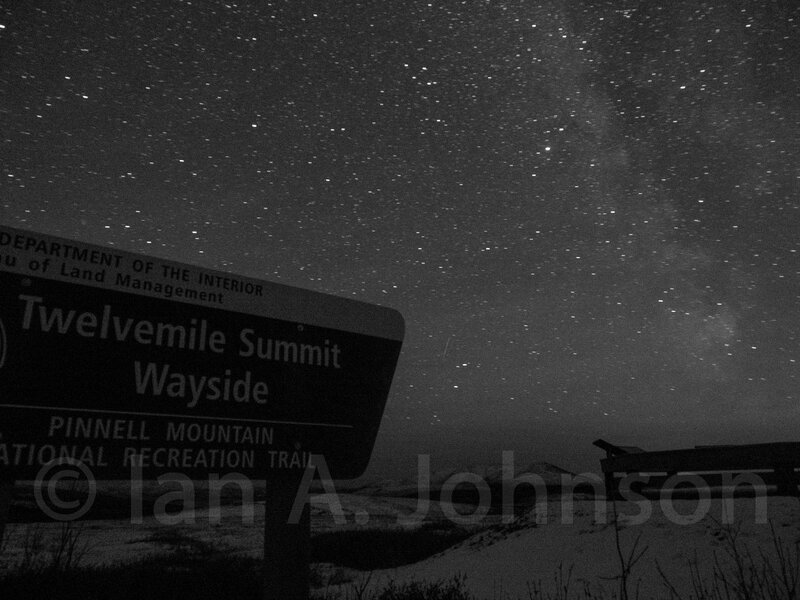 This image is of the Milky way over the 12-mile summit off the Steese Highway. It represent and incredible portion of the cosmos, but also illustrates how even areas that we consider to have the ‘darkest’ skies are still addled with light pollution. Here the Milky-way can be seen in full. The image has been enhanced to reduce the effect of the light pollution. While observing the cosmos we watched many shooting stars streak across the sky. One of them lasted for so long we contemplated going after it, as we were sure based on its trajectory that it had buried itself somewhere just outside of Barrow. Our backs and neck ached with the craning our heads to the stars above, but there was not stopping our watching. You’ll notice the title of this entry is “In Pursuit of the Aurora”. On this night, even with the solar activity, the aurora evaded us. We stayed up until 1AM and at time the clouds started to roll in. Although I’m confident there was an Aurora this night, we were unable to see it. However, at about 12 AM one of the the most interesting phenomenon occurred. Simultaneously Ross and I looked to the horizon and came to the same conclusion: there was a fire and it looked to be big. The fire continued to grow and a minute later we realized our folly as a blood-orange, crescent moon rose quickly over the hillside. It illuminated the landscape around us in its light. 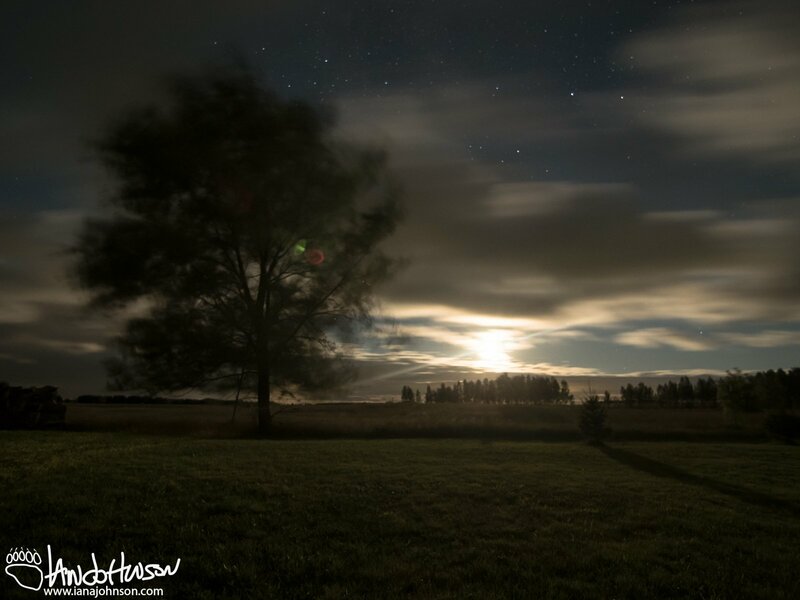 The moon and the new cloud cover convinced us that sleep was more valuable than the aurora on this night.